When it comes to English language proficiency tests, two names immediately come to our mind- IELTS and TOEFL. Both are reigning names in the field of English proficiency. While some agencies and universities specify what test results they accept, others leave the decision on to the applicants. In such a scenario, it becomes imperative to know about the specificities of both the formats so as to make an informed choice. Are you adept at handling computers? Are you comfortable in speaking spontaneously with the help of a microphone? Do you have a decent and quick typing speed? Is standard American English what you’re comfortable with? Are you good at answering multiple choice questions? Can you take notes from a recording promptly? Lastly, are English sources you read/listen/watch more educative than entertaining? If the answers to most of the questions above is ‘yes’, then TOEFL may be most suitable for your skill sets and analytical capability. Do you have a legible handwriting while writing English? Are you comfortable with detailed face-to-face interviews? Can you understand more than one dialects of English, for instance Canadian English; Australian English; British English etc? Do you prefer tests which have variety of questions like matching type, flowcharts, fill in the blanks etc rather than just plain MCQ’s? Are you more at ease when discussing non-academic topics in English than academic? Lastly, the English sources that you read/listen/watch are more entertaining than educative? 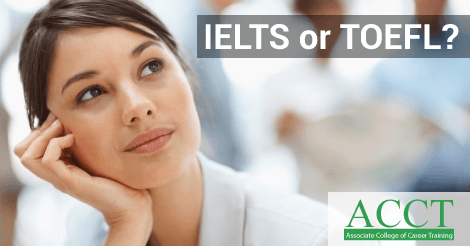 If answers to most of these questions are yes, then IELTS is more appropriate option for you. Make a smart choice while choosing your English proficiency test because your scores in this test impinge a great deal upon your college admissions.